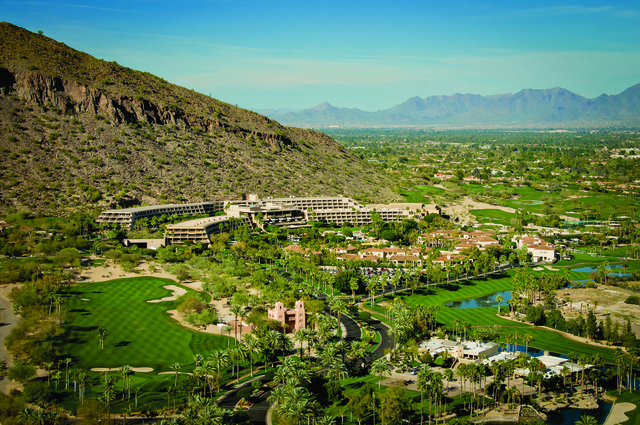 Contoured out of the beauty of the spectacular Sonoran Desert in Scottsdale, Arizona, The Phoenician features a 27-hole championship golf course that inspires your spirit of adventure. Designed by Ted Robinson, Sr. and Homer Flint, The Phoenician’s three diverse nine-hole courses create 18-hole combinations for the challenge and fun you crave. Tee off on the finest golf courses in Scottsdale, Arizona, with 6,300 yards of extraordinary terrain with gorgeous greens, pristine desert views, breathtaking scenery and Arizona’s only sand-island green! Accommodations in the main resort building feature imported Italian linen, signed original artwork and rich Berber carpeting. The rooms have two double or one king bed, a wood entertainment armoire, double dresser, large writing desk and seating area. The oversized bathroom is decorated with Italian marble and has a separate bath and shower. Full-width sliding glass doors lead to a private terrace or balcony complete with a table and chairs so you may enjoy your view of the resort’s dramatic surroundings. (600 Square Feet / 56 Square Meters). With two bedrooms and three baths, these spacious suites are ideal for families or small groups. The large parlor has a travertine fireplace, entertainment center, sofa and dining table for six. Sliding glass doors lead to a furnished terrace or balcony. The master bedroom features a king bed, writing desk, entertainment center and marble bath with separate tub and shower. Glass doors lead to a furnished terrace. The second bedroom has two double beds, entertainment center, separate tub and shower and a third furnished terrace. Providing the highest level of guest service, The Phoenician Resort’s professional concierges are dedicated to the needs of both business and leisure travelers. With a personal touch and enthusiasm uncommon in a world accustomed to self-service and automation, we offer a broad range of services. From planning local sightseeing excursions to arranging the next leg of an international tour, we handle your every need with the highest level of professionalism. For international guests, the multi-lingual staff can assist with travel and business arrangements, and for families vacationing at The Phoenician Resort, excellent childcare is just a phone call away. A dining experience at The Phoenician Resort is a blend of pleasing sensations whether you prefer elaborate candlelight dinners or light snacks on a sun-drenched patio. Private gatherings, both large and small, can be accommodated with comfort and gracious hospitality. With its globally-inspired private dining menu and Renaissance interior, this working wine cellar is a dramatic setting for special occasions, complete with barrel-vaulted ceilings, brick archways, antiques and seating for up to 16 guests. From innovative cuisine, to vibrant décor and sweeping city views, J&G Steakhouse is a dining experience rich in style and taste. Afternoon tea is served daily in the Lobby Tea Court. Voted "Best Afternoon Tea", it includes finger sandwiches, scones with imported Devonshire cream and preserves, pastries and a selection of fine teas. Classical music provides a charming backdrop. Hours: First reservation is at 2:00 PM and is scheduled in 15 minute intervals. Last seating is 3:00 PM. The AAA Five Diamond Phoenician is consistently recognized as one of the world’s finest resorts, receiving honors for a variety of services and programs, from dining to golf. The Phoenician resort's light-infused lobby features cascading fountains, elaborate crystal chandeliers, inlaid marble floors and a sampling of the resort's 25 million dollar art collection. Dining options include a range of cuisine and customized menus at J&G Steakhouse, which is open early evening until late evening. The Terrace offers a menu that includes Kobe top sirloin and pan-roasted Atlantic salmon. Windows on the Green prepares southwestern-style dinners and displays a carved travertine fireplace, regional paintings, and American Indian pottery. Additional dining options include the Thirsty Camel Lounge, the 19th Hole Snack Bar and Patio, and the Lobby Tea Court. The hotel features nine outdoor pools, one lined with mother-of-pearl tiles. A 27-hole championship golf course with a pro shop and clubhouse is on site. The Tennis Garden features 10 lighted courts, a Wimbledon grass court, an automated practice court, a pro shop, and a clubhouse. The Centre for Well-Being, a full-service spa, offers massage and beauty treatments, including the Kachina Salt Skin Cleanse, the Golf Meditation and Table Thai acupressure. A fitness studio features cardiovascular and weight-training equipment. Funicians Kids Club offers themed adventures and organized activities for children ages 5 to 12. For business travelers, The Phoenician offers 160,000 square feet of meeting and conference space, and wireless Internet access is available for a surcharge. This property offers 647 guestrooms and 108 casitas. Décor includes sage and ivory color schemes, crown moldings, richly crafted wooden furniture, Berber carpets, marble tabletops, pewter lamps and signed original artworks. Beds are draped with 500-thread count imported Italian linens. Bathrooms feature inlaid Italian marble, and separate bathtubs and showers.